Andy Webster has called on Hearts fans to take into account the club’s wretched injury list before criticising manager Craig Levein. The Jambos boss was barracked by some home fans in Tynecastle’s Main Stand in the wake of Saturday’s 2-1 derby defeat, a result that moved Hibs above them in the Ladbrokes Premiership and dented their Europa League hopes. Levein revealed post-match that he had no plans to quit his post as Hearts manager, with all attention turning to this weekend’s William Hill Scottish Cup semi-final against Inverness at Hampden. Former Tynecastle defender Webster understands the frustrations of Hearts fans after such a bright start to the season – they were six points clear at the top of the league in October – but feels they need to be realistic considering they have lost talismanic forward Steven Naismith, club captain Christophe Berra, fellow centre-half John Souttar, striker Uche Ikpeazu and full-back Michael Smith for lengthy periods of time. “Criticism is part and parcel of football whether you are a manager or a player,” said Webster. 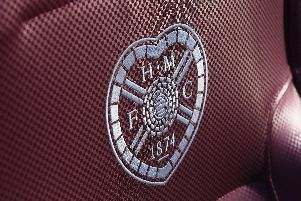 “Craig Levein has been there before so he is experienced enough to handle it. “I haven’t looked into the criticism too deeply, but I know he has had some. “The initial part of the season was outstanding and when that happens expectations start to rise and people are looking for more. “But then when you have injuries to key players like Christophe Berra and Steven Naismith it’s going to have a major impact on your squad. “They are two key figures so, as much as it’s an opportunity for others to come in, it’s a major disappointment that two of you best players are missing for a period of time. “All of these things have to be taken into consideration. “I have been there myself. When you start very well people get excited. But it’s hard to maintain. With the clash against John Robertson’s Inverness taking on huge significance for the rest of Hearts’ season, Webster – a Scottish Cup winner with Hearts in 2102 – believes it doesn’t matter how his former team play in the game, just as long as they win. The Jambos’ style of play has been called into question under Levein, but Webster said: “Everybody has an idealistic approach to playing football, a certain style of play. But you also have to utilise the tools that you’ve got. Uche Ikpeazu has a physicality about him that will cause any player problems. “I played with Mark de Vries at Hearts the first time around and he was in the same mould. Whether you call that one-dimensional or playing to your strengths, you can dress it up any way you want. If it’s effective and it gets your team to win, are you really that fussed? • Andy Webster was speaking at a William Hill media event. William Hill is a proud sponsor of the Scottish Cup.